Notes and commentary about Southern California weather, snowpack and climate. Downtown Los Angeles Ends Rainfall Year at 127% of Normal. Record PDO Positive Streak. 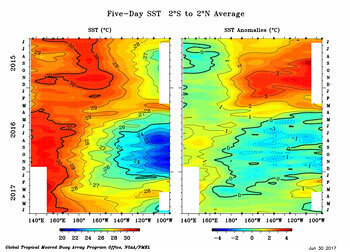 MEI Near Strong El Nino Threshold. Downtown Los Angeles (USC) finished the 2016-17 rainfall year (July 1 to June 30) with 19.00 inches of recorded precipitation. This is about 127% of the 1981-2010 normal of 14.93 inches. This was the first rain year with above normal precipitation at Los Angeles since 2009-2010, when 20.2 inches was recorded. As of May 2017 the Pacific Decadal Oscillation Index has been positive (warm) since January 2014 -- a record 41 consecutive months. The previous record streak was 36 months, from August 1991 to July 1994. Most climate outlooks are projecting ENSO Neutral conditions are favored to persist into the Northern Hemisphere fall, with a lesser chance of weak El Nino conditions developing over that period. Perhaps supporting the notion of El Nino development, the April-May value of the Multivariate ENSO Index (MEI) increased by 0.69 standard deviations from 0.77 to 1.46. This is solidly within the index's El Nino ranking and at the threshold of a strong El Niño ranking. According to Klaus Wolter, the increase over the last three months is the second largest on record for this time of year, exceeded only by 1997. 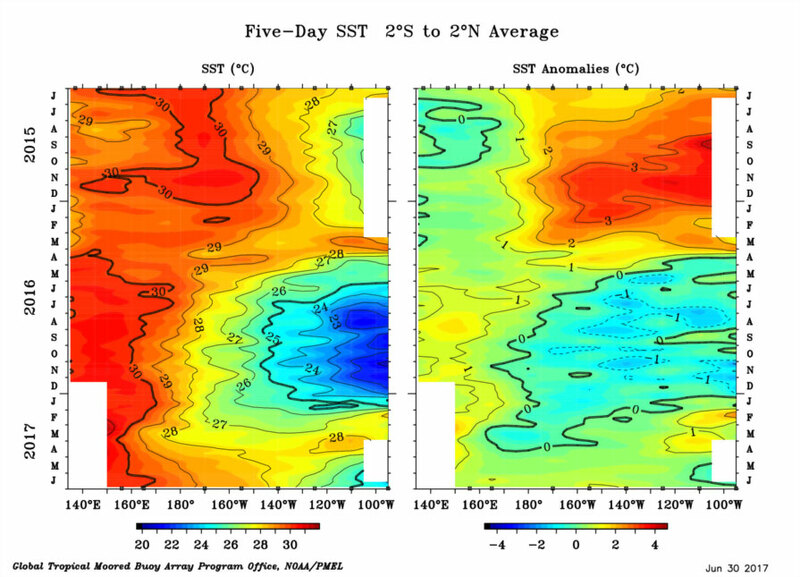 We'll see if ENSO conditions remain neutral or some form of ENSO warming (Central Pacific?) takes place. More information about Southern California weather and climate can be found using our WEATHER LINKS page. The information presented on this web site may include errors of transcription, interpretation, and other errors. The information may be out of date or inaccurate. Please refer to the NATIONAL WEATHER SERVICE FORECAST OFFICE LOS ANGELES or your local weather service office for official forecasts and warnings.